Remember the Octavia? Yes, the very car that introduced Skoda to India. It's the car that gave the Czech brand the status it enjoys today. I remember the car for being a favourite among entrepreneurs as well as racer boys. Well it's back. Not that it wasn't around. After all, the Laura was just a renamed second gen Octavia, since both cars were sold together. Fast forward to now and it's the third generation model that is aiming at becoming the D-segment benchmark. But it isn't easy this time around. 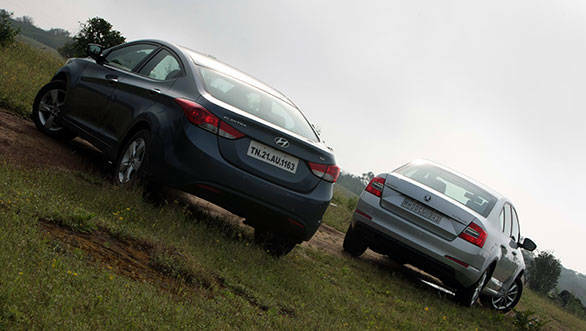 The Hyundai has proven to be a capable car and is currently the bestseller in the segment today. So what did we do? Take the Czech and Korean cars straight to a dogfight. What else! Both cars follow two different design approaches. While the Elantra's Fluidic philosophy carries forward a curvy and loud design, the Octavia sticks to a sharp and edgy theme. While the Laura looked like the first generation Octavia's successor, the new Octavia has an identity of its own and has no family resemblance. This isn't a bad thing since this car is the first Skoda model to follow the brand's all new design language that was first showcased in the striking VisionD concept. This gives the car a modern yet elegant look. The Elantra has been around for a while now but out on the road, it still attracts a lot of attention. The Octavia MT variant isn't offered in the top end Elegance variant so it misses out on projector headlamps and striking daylight LEDs seen in the automatic variant. The top end Elantra SX variant makes do without these features. Of the two in our opinion, the Elantra is attractive and the Octavia is smart. It's the same story inside too. The same themes are carried forward to the interior as well. 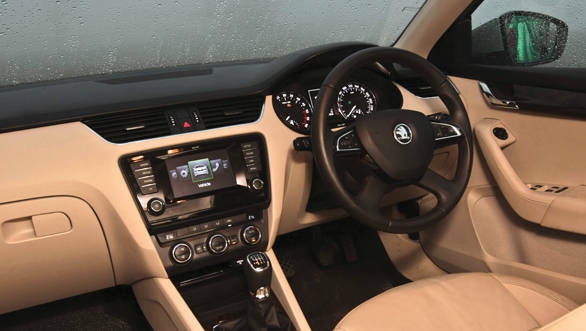 Both cars feature dual tone beige and black interiors but the Skoda's lighter beige hue gives it an upmarket look, both get chrome detailing too. When it comes to comparing build quality, it's a tough call. 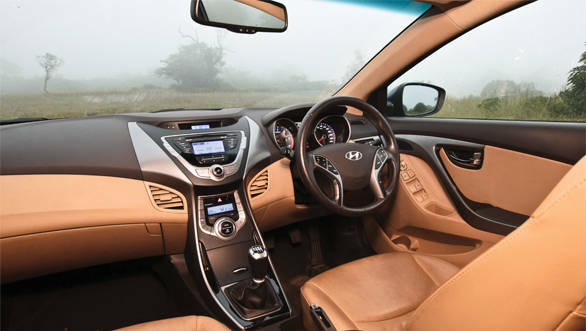 In terms of convenience, the Elantra offers extra features such as an electronically adjustable driver seat, cooled front seats, push button start and rear arm rest mounted audio controls. The Octavia lacks all of these features but boasts a touch screen infotainment system that displays vital information including car system warnings, fuel consumers and trip details. The 5.8-inch screen blacks out when not in use and comes back when the built in proximity sensor detects movement just like in a cell phone, quite cool. Talking space and comfort, the Skoda being a longer car, offers slightly more rear knee room than the Hyundai but it is hardly noticeable. The front seats are firm and supportive but the seats at the back are almost flat and don't offer much under thigh support. The Hyundai offers as much cabin space and is also more comfy especially at the back and should appeal to people who are chauffeured. The Octavia has always scored when it comes to boot space and it's no different in the new model. The huge 590-litre boot is 150 litres bigger than the Elantra. And since the car's tailgate still opens like a hatchback, loading and unloading objects are easier too. And if needed the seats fold down to offer an additional 1,000 litres. The Octavia carries forward the same 2.0 TDI from the Laura, the engine puts out 143PS at 4000rpm and 320Nm of torque from 1750-3000rpm. 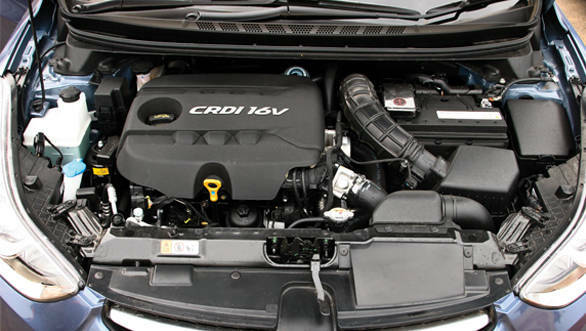 The Elantra features a smaller 1.6-litre motor borrowed from the Verna. So maximum power output is 128PS at 4000rpm while peak torque is rated at 260Nm. Both cars are mated to a six-speed manual transmission. The Elantra offers shorter shifts but the feel could have been better. The gear shift in the Octavia does have a positive feel but requires more effort. Out on the road, both the cars display very little turbo lag and power delivery is quite linear. But like on paper, the Skoda does have an advantage in terms of performance. The difference in torque is immediately apparent while on the move. 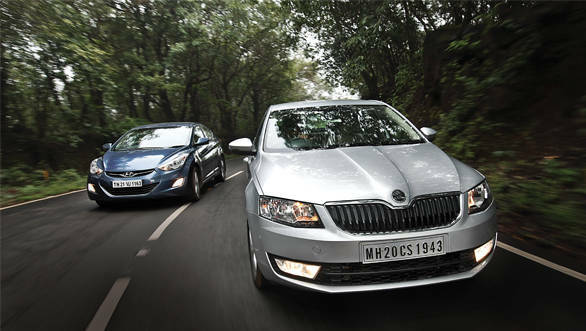 The Octavia does 0-100kmph in a super quick 8.55 seconds making it the quickest diesel car in its class, the Elantra does the same in a slower 10.83s. Roll-on figures are also much quicker in the Skoda. In terms of top end performance, the Hyundai begins to lose breath after an indicated 180kmph while the Skoda reaches 200kmph without any fuss. The Elantra is quite a performer considering its engine size, it, however, loses out to the more powerful Octavia. What about fuel efficiency? The ARAI figure for the Elantra is a claimed 22.7kmpl, while the Octavia's is 20.6kmpl. In our test the Hyundai returned 14.1kmpl in town and 22.8kmpl on the highway while the Skoda returned 13.4kmpl and 21.3kmpl respectively. This translates to an overall figure of 16.3kmpl and 15.4kmpl respectively. While the new Octavia 1.8 TSI uses a more complex and independent multi-link rear suspension, the diesel 2.0 TDI variant makes do with a torsion beam unit. 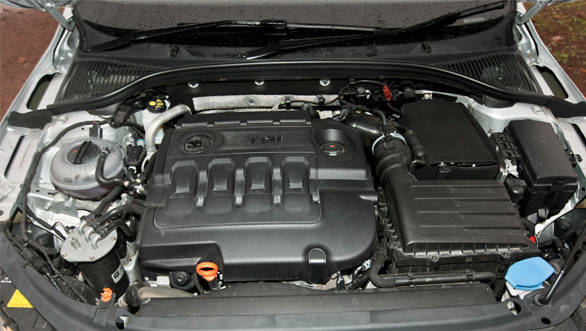 In our opinion, the diesel variant should have also featured the same setup as the 1.8 TSI, the former even costs much more. The Elantra is only available with a McPherson strut and torsion beam setup and is tuned to ride well over potholes and broken surfaces. The Octavia's suspension setting has been tweaked for India and the ride height has been increased for better ground clearance too but the suspension does get noisy especially over broken and bumpy surfaces. The stiffer ride is responsible for this, but this stiffness also makes the car better planted at higher speeds. The Elantra may be one of the better handling cars from the Hyundai stable but it still can't better the Octavia in this department. The Hyundai's steering is much lighter which is good news if you're driving in town, but on the highway and at higher speeds the electric unit lacks character and feels disconnected. The Octavia's steering too is light (compared to the previous gen model) making it an easier car to drive in town but it still manages to retain the dynamic feel its predecessor boasted. The Octavia is a much improved car in every department. It is more spacious than before, more powerful, more efficient and better looking too. But the Octavia finds it hard to match the Elantra's value for money package. 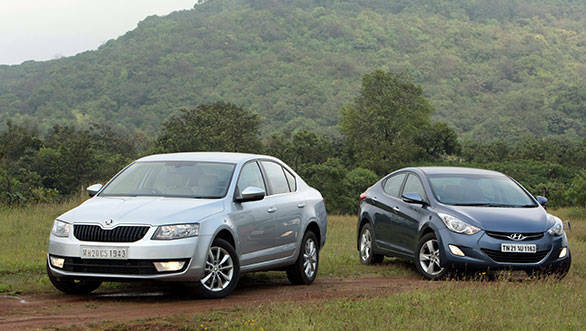 The Skoda car we are driving today is the Ambition variant, and it is priced at Rs 20.18 lakh. For this much money it doesn't offer the comfort and safety features that the Elantra SX offers, it even misses out on small features like a vanity light. 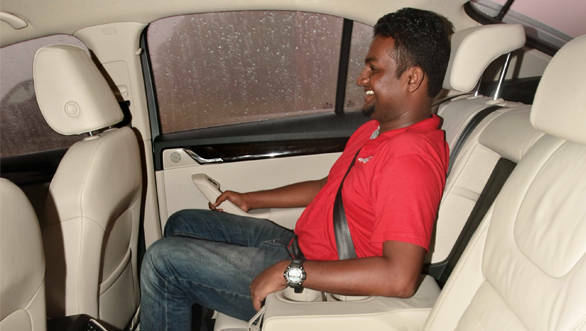 The SX meanwhile can be all yours for Rs 18.53 lakh while the equivalent variant that competes with the Octavia Ambition is priced more than Rs 3 lakhs lower at Rs 17.07 lakh (all prices are on road Mumbai). The Octavia may be back and this has been a close battle, but it's the Elantra that manages to hold on and finish on top of the D-segment league.